Location: Shiny Canyon, in Facebook! A great number of pixels have been used to praise or critique Cloud Party over at Hamlet Au's New World Notes. True, one needs a Facebook account, and sacrifices anonymity, to use the service fully. Anonymous logins are possible at the link I gave above, but they only permit limited interactions and the avatar's experience and content--as far as I understand--do not persist. No client: this is key to mass adoption. For educators, it means that a student only needs a FB account. That means about 100% uptake for my students. Real life ID: for Millennials, that too is key. They find virtual worlds "creepy" because, to paraphrase most of my 100+ users, "you don't know who is on the other end of the wire." Their faith in authenticity may be naive, but it's strong and consistent in this demographic. Blame it on 12 years of "Internet Safety" classes rammed into their heads by schools. Users such as "Pussycat Catnip" argued, with me and others in a long string of commentary at Au's blog, that one key aspect of enjoying SL is being able to assume a new identity. For her, Cloud Party's link to Facebook "makes it useless for anyone wishing to explore concepts like identity or self expression." Frankly, that matters little in how I've used virtual worlds, save for the House of Usher simulation, which is a one-off assignment with roleplay. Fretful administrators at colleges and universities will like the seeming transparency of Cloud Party as currently configured, though I suspect that "Cloud Party" to be only a marginally better name than the tainted "Second Life" moniker. I'd have preferred "New World" or similar, but Cloud Party goes not purport to be an educational tool. Nor did SL; we just took to it, and so did many others with some very different interests and intentions. Easy UI that looks bound for mobile devices: Desktop rigs are the choice for serious games for serious gamers. They are not my students or colleagues, however; gamers here are a very small, and disrespected, part of the student body. When mainstream students do play games, they are more likely to pick up a console or play a casual game on their mobile devices and laptops. Cloud Party exploits the metaphors of mobile computing nicely. The Control Panel, shown here, looks like a smart phone and, when opened, provides small icons straight out of the world of mobile computing. Perfect Timing. Educators screwed over by Linden Lab's mid-year doubling of tier have been looking for something easier to use than OpenSim. I think something like this new virtual world could do the trick. My Avatar looks like a newbie refugee from The Sims Online, but I can live with that. Building is very much like SL, from what I see. Linden Lab needs to be worried...very worried. Storm Clouds? Right now, unless a browser supports WebGL, it won't run this virtual world. Nor will iOS devices. I am searching for a app to try it on my iPad. Android users may have more luck. But for now, the majority of computing on my campus is done with laptops on wireless. About 70%, at last report, of new students bring Mac OS laptops. On my MacBook Pro, Cloud Party runs very well and the fan never comes on, as it does constantly with SL running the Firestorm viewer. I hope that Cloud Party pursues access to all tablet OSes, though one wonders if Apple and Microsoft will open their mobile OSes to WebGL; on a phone Cloud Party would not be useful for more than texting. A tablet might be too constrained for building, but given my limited experience, my iPad's screen is plenty big for moving and chatting. 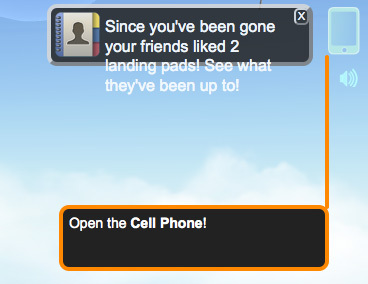 Much of Cloud Party depends on right clicks, so that would need to be fixed for mobile users. Now for the experience: In two visits, I completed the basic and build tutorials and got a free house in a region called "Shiny Valley." Easy enough for veteran SLers. What about those new to virtual worlds? The tutorials were excellent, better than what I found in Second Life and more akin to my unalloyed joys of the first hour in Glitch. My interest in Glitch waned, I admit, because of the lack of realistic avatars and its side-scroll interface. Here I am being greeted by Gwenette Sinclair, one of the new neighbors. I know, it's The Sims kinda-sorta. But shiny! It's nice to feel happy about this shiny new virtual world. I hope the happy dance continues. Come by Shiny Canyon for a visit. I don't know about the "real identity" thing. I just joined with my SL avatar name and most of the people I saw in the cloudparty were fellow SL'ers using their SL names. A strict real ID policy would be a shame as it would turn away many experienced 3D builders etc. Not to mention the privacy issues such a backward step would mean. Great post! I think that minds are opening to the concept that just as we use more than one textbook to teach a course, we will use more than one virtual platform - some complete worlds, some simple conference rooms . . . #CLOUDPARTY has entered the race for adoption by many niche populations, including educators. I think CLOUDPARTY is here for the long haul and will become one of the primary platforms in the 21st century educator's toolkit.